Here's a great website to help you play your own Google Map based April Fool's prank. 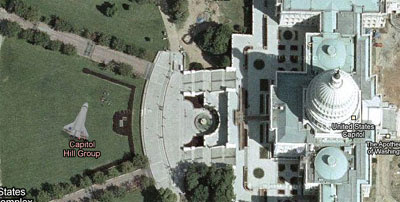 Aerial Photo Phonies lets you add a number of objects (including the space shuttle, a London bus or sunbathers) to Google Maps satellite imagery. To create your own joke satellite view just find the required location on the map, choose your image and Aerial Photo Phonies will then give you a link to a realistic looking Google Maps site. The White House doesn't have a dome. I was close though! Well at least in the same city.